We woke up today on our last morning in tropical surf town Ahipara – since we were hitting the trail rather than resting we woke up at 6:30, had a rare hot breakfast of oatmeal with coconut powder and bananas and left the holiday park as soon as we could. We walked through town and tried to hitch for most of our winding 8 km road-walk up to the entrance to the Herekino Forest, but only were successful in snagging a ride about 2 km from the trailhead – Shepard and I got picked up about a km before Jasper and Jack (we walked in pairs of 2 to have a better chance of getting picked up). 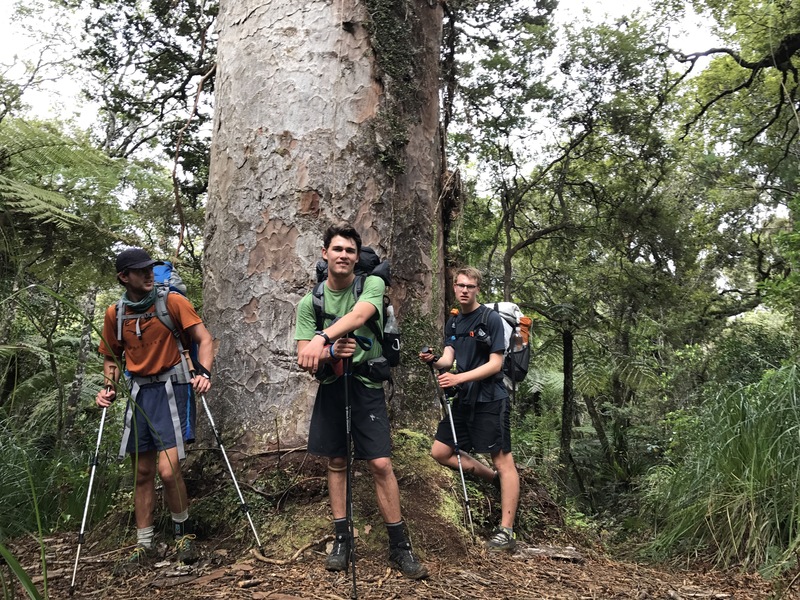 At the entrance to the forest is a station where it is encouraged that trampers clean their boots to help prevent Kauri tree dieback, which is spread though soil transfer. 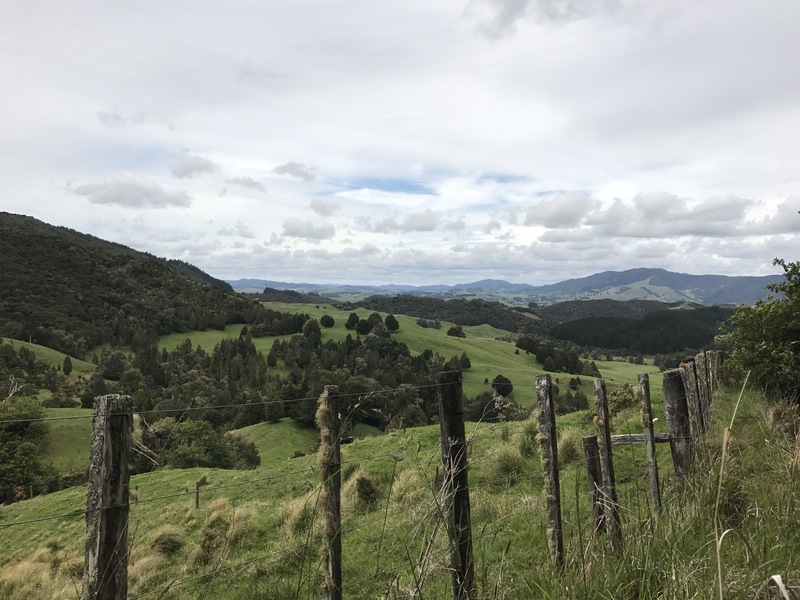 The hike through the forest was a little slippy slidey, as we had been warned it would be – even regardless of the wet spring the area has been having, these Northland forests are notoriously very muddy. Really not too bad, though there is one steep downhill section with ropes, after the peak. About an hour into the hike we came up behind a large group: the young French couple named Annabelle and Greg with whom we’ve been on a similar schedule for the past couple days, as well as a middle-aged British hiker, an 18-year-old named Hamish from Palmerston North, and an older couple from Kerikeri, who as we passed them told us we sounded “too happy” for the conditions. Guilty as charged there; I think each of us has said at some point how glad we are to be hiking this trail with three other people. (A side note: I think at four we are the largest group currently hiking the trail). Later on we walked for a little bit with Hamish, who hikes impressively steadily and didn’t even take a rest day after 90 mile. By contrast, our hiking style has settled into one of hiking (injuriously) fast in order to take long lazy breaks. The trail led us through the intensely thick jungle, up a ridge with some short views over 90 Mile Beach, through groves of massive kauri trees and along a blessedly flat and wide ATV trail for a short while, before depositing us into a picturesque, almost Sound-of-Music-like meadow area with cows dotting the hills. Thankfully, streams were running so we could fill up a couple places, but it’s safest to enter the forest with all the water you might need for the night. Descending from the meadowy area on a gravel logging road, we were on the lookout for a campsite as our (or at least my) aches and pains grew, and finally found a spot around kilometer 126 (where we had been told there might be a good place by a fellow American hiker we talked to in Ahipara). We pitched our tents about a hundred feet from a river in a young, exclusively pine forest: the local who drove us to Cape Reinga explained how they clear-cut a section of jungle and then plant pine trees to cover that whole area, and apparently about every 30 years the area is cut again and new trees are planted. The pine trees look very strange next to the dense and super diverse jungle and I get the feeling that they aren’t even native. 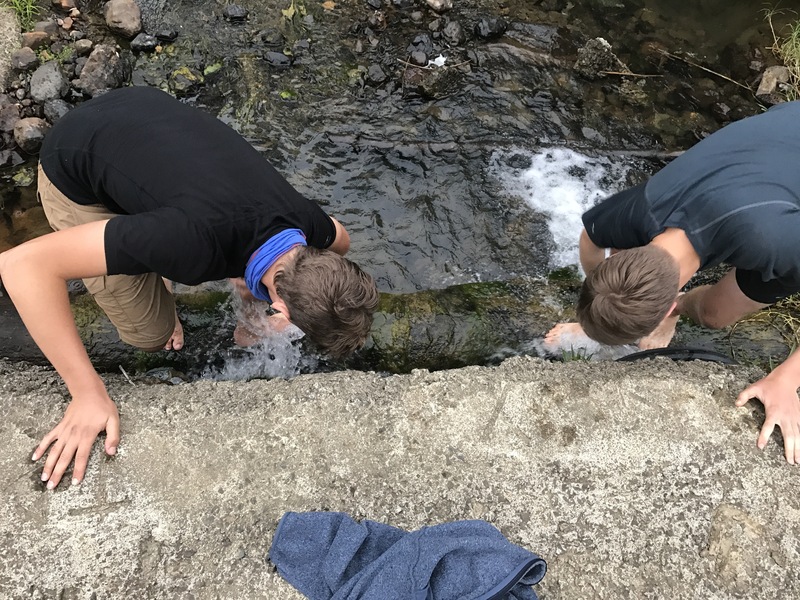 After a meal of pasta and mashed potatoes Jasper and I washed our feet in the stream by our campsite, and as we and Jack talked under the cloudy sunset we spied a freshwater eel in a pool on the side of the stream to round out the day. It was one of the most extended chilling-at-campsite times yet, thanks to the good weather, and as Jasper pointed out, our first campsite-finding experience (rather than camping at an established site). Tomorrow we hike further into the Northland Forests section, passing through the village of Takahue and hopefully entering the Raetea Forest.